NZHIA Government Committee – An update from the Chairperson, Chris Woodney. It seems we have turned the corner with the MOH, finishing our first meeting of 2019 on a positive note. A lot of work has been put in by the government committee over the past 12 months to get us to this point and it seems with the change of government and DG the working relationship is getting better. We have had some wins though, which is good. Now only responsible persons will be needing police checks, not all those over 17. MOH online applications are soon to be operational for new applicants, renewals and amendments. Significant changes have been taken on board for the new application forms reducing the double up of information. The major focus for us though has been getting the MOH to understand that without all revenue streams the industry will struggle to compete both locally and internationally. Industry want to sell biomass to licensed producers. Without this valuable revenue stream, grain prices will remain high, and the industry will be unable to compete with imported products, and also be too pricey for the international market. We reached out to the newly formed Medical Cannabis Council at their workshop to gain support for industry supplying them with biomass. The answer was a unanimous YES. The workshop was to gather feedback on what these companies wanted to see in the Regulations which is to be provided by the Ministry of Health, this year. I attended on behalf of Industry to ensure we try to untangle iHemp and its products from any association with medicine or pharmaceuticals/drugs. The topics discussed ranged from micro grow licences right through to GMP production. There was a unanimous agreement that those with cannabis convictions should be allowed to enter the industry under the supervision of a responsible person as with the hemp industry. Dishonesty and violence convictions were not accepted to be appropriate convictions. Discussions moved to kiwi genetics and what the amnesty would look like, some thought it should be ongoing and I agree. This would give the black market time to build up some trust and see some returns for others in a regulated market place. The social media response from a few in the cannabis community was that it was a bunch of money hungry opportunists looking to make their own rules and exclude others. I guess that’s how the Hemp industry pioneers were once viewed. I can tell you from my attendance that this was a very patient-focused working group looking to minimise the supply chain and maximise it’s ability to get affordable products to patients, (that is, the less hands the product has to go through the cheaper it is for the end user). The truth is that no matter how much money you have, it is those that have done the research applied the science and perfected their products that will be the stayers in this medical game. Critical mass is almost at tipping point keep spreading the word about hemp as it’s our kids that will do amazing things with it not us! Fill in the anominious, Food Safety Australia New Zealand (FSANZ) survey. Hulled hemp seeds from low-THC plants and food derived from hemp seeds are now available for sale and consumption in Australia and New Zealand. To support the objectives of a consistent bi-national food regulatory system, the Australian and New Zealand governments are now gathering and consolidating information on existing activities and controls throughout the supply chain. In order to do this, a survey has been developed for all Australian and New Zealand businesses involved in the growing, processing, manufacturing and importing of low-THC hemp for food for human consumption. Your input is highly valued and we appreciate you taking the time to complete this survey. Please feel free to share this link with other businesses who are involved in the above activities relating to low-THC hemp for food if you believe they may not have received it. Please note that all information collected will remain strictly confidential. The survey will run from 13 February until midnight on 13 March 2019. If you have any questions regarding the survey, you can email food.contact@dpi.nsw.gov.au. 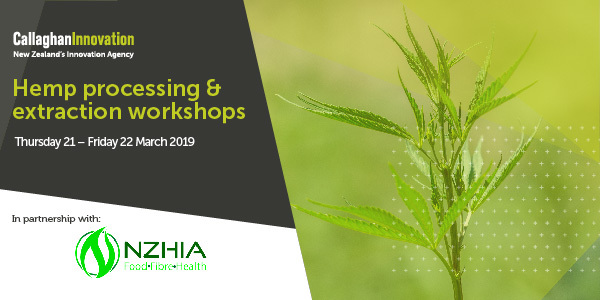 AgResearch is hosting a workshop with Australian CSIRO researchers interested in the hemp research area with the aim of establishing areas of joint research in this field. To provide some direction for the discussions AgResearch are conducting a short survey of growers and would-be growers. And the same survey has been sent to the Australian state regulators. Please complete the survey. It’s quite short but will provide some direction to our R&D planning. The an overall analysis of the results will be shared with the NZHIA ‘after March 25th. Please encourage other interested parties to complete the survey by March 25th 2019. Extraction Workshop – Callaghan Innovation: 21-22 March 2019 – Lower Hutt Wellington. Demo Day sold out – Tickets still available for Day 1, 21st March. Take a deep dive in to the practicalities and technologies of extraction with US Expert – Dr Jerry King sharing his 50 years of experience in the botanical extraction industry. 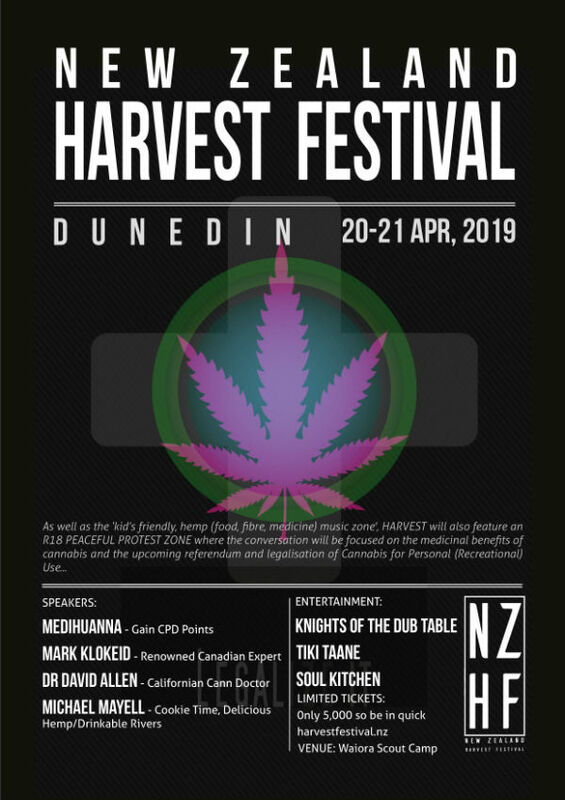 20-21 April 2019 – New Zealand’s first – Hemp Harvest Festival, Dunedin. Go to www.harvestfestival.nz for more details and to book your ticket, with promo code NZHIA !!! Use promo code “NZHIA” and get a 20% discount on your ticket. A futher 30% will be donated to the NZHIA. You get to attend a great event at a discount and support the NZHIA at the same time, a win win deal! Join the NZHIA for more information and support for your hemp enterprise, together we stand!